Russia and Italy are resuming their joint development S-1000 submarine, which is an export version of the Amur class submarine. The joint development is between Rubin Design Bureau of Russia and Fincantieri of Italy. Although the main global producers of submarines such as Germany, France and Russia continue to receive stable revenues by exporting their submarines, the development of modern models is becoming more sophisticated. This often requires cooperation with other countries. Cooperation also enables the partners to make development and production less expensive. In conditions where more and more countries are planning to create or upgrade their own submarine fleet the Russian-Italian project on building the S-1000 submarine promises to become a profitable enterprise for both countries. The idea of creating a joint Russian-Italian submarine emerged in the late 1990-s. 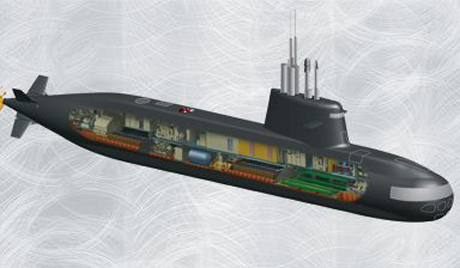 The actual development of the 1000-tons heavy submarine began in 2004. In 2008, the work was interrupted because of the global economic crisis. However, today the situation looks more optimistic with the growing demand for submarines in the Asian-Pacific region. The new submarine can interest any country that is looking for less expensive solutions. S-1000 is a quite universal submarine. It is designed for anti-submarine and anti-ship warfare, reconnaissance missions, and the transportation of up to 12 troops. The submarine is equipped with a new fuel cell-powered Air Independent Propulsion (AIP) system developed in Italy. The price of the future S-1000 is not unveiled but industry experts say that it won’t exceed $120 million-150 million per unit. This price even together with the costs of maintenance and crew training makes the submarine affordable even for relatively poor countries. Taking into account the current state of the joint project the production of S-1000 can start already in 2-3 years. Moreover in terms of price this project has almost no competitors. Cooperating with Italy on S-1000 Russia will also continue working on other Amur-class submarines for example Amur-950. This is a more expensive submarine which also features an impressive array of weaponry including missiles. It is known that Russia’s Defense Ministry is planning to resume the serial construction of 677 submarines for the national Navy. These submarines are equipped with the Air Independent Propulsion (AIP) system. The export version of 677 is known as Amur-1650. China and Indonesia are showing interest in buying these submarines. This entry was posted in The world's submarines and tagged Fincantieri, Italy, Rubin Design Bureau, Russia, S-1000 on February 20, 2013 by jasonlockley.